A delicate 14ct Strawberry Gold chain boasts an elaborate, sparkling pendant from Le Vian. 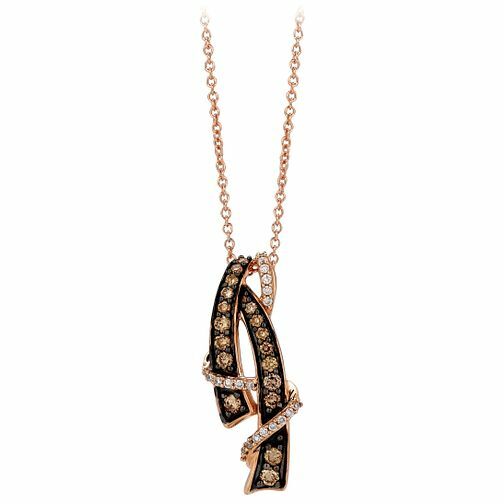 Two twists of Chocolate Diamond set Strawberry gold are entwined with dazzling Vanilla Diamonds. A luxurious combination. Le Vian 14ct Strawberry Gold 0.37ct Diamond Pendant is rated 3.0 out of 5 by 1. Rated 3 out of 5 by Anonymous from NIce Pendant Thin Chain I ordered this necklace on line and was very pleased with the speed of the delivery, but when I opened the package it was not quite what I expected. The necklace was in a torn plastic bag, the chain had a knot in it and it needed a good clean. After untying the knot and cleaning the pendant it is very beautiful, but to me the chain lets it down as it is so thin and delicate looking and to be honest a bit disappointing for a price tag of over £1,300. I will not be buying anything from Earnest Jones on line again as the service is disappointing. I would recommend this product if bought in at the retail outlets.